We stood at the unmanned maître d’ station at the Delta’s Mickey Quinn’s bar and dining room long enough to read the various menus displayed (for bar and restaurant) and to scan the front page of the Telegram. On the cusp of our decision to leave for another restaurant a server appeared. We decided to stay. In my mind I briefly heard the Clash singing “Should I stay or should I go?” Then, as we were being seated in the dining room, “If I go there will be trouble. An’ if I stay it will be double.” Was it an omen I wondered? A large convention was happening in St. John’s and Micky Quinn’s bar area was mostly filled by convention delegates. I saw only two servers waiting on tables for the bar and dining room. Front of house was understaffed. Strange since the hotel appeared to be full of guests. Mickey Quinn’s drinks list was robust, with everything from vintage classics to popular modern martinis on the way to becoming classics. One eye catching section was labelled “local flavour.” It had selections with names like: Quidi Vidi Koolaid, Mudder’s Slush, Jiggy Juice and Newfie Shandy. I was a little surprised that such a large business, with international affiliation, would risk using the word Newfie in a document. Newfoundlanders are split in their views on this term. Some think it fun and endearing, others find the reference highly derogatory. 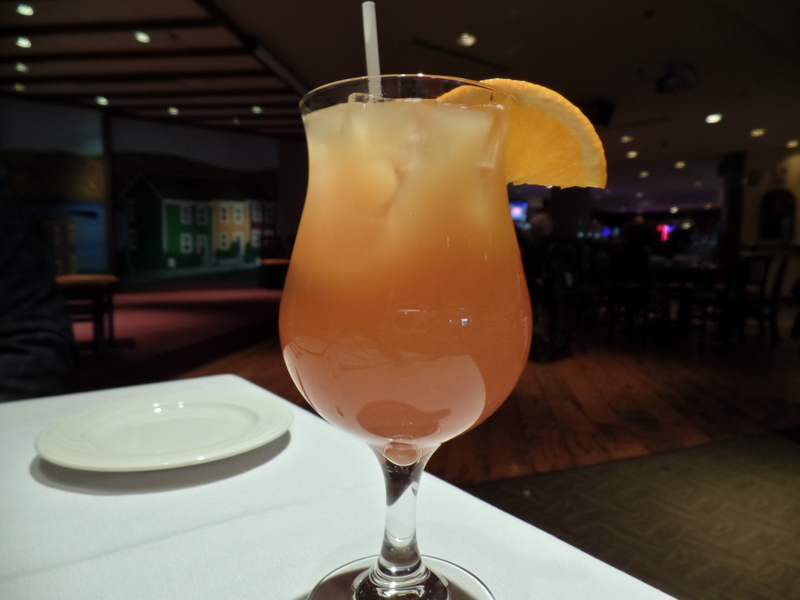 Jiggy Juice was a rum based combination of Screech and coconut flavoured rum over ice with a mix of orange, pineapple and cranberry juice. Most likely you’ve tasted it, if not at Mickey Quinn’s at a house party, a birthday bash, anniversary do or something similar. It’s the kind of punch that results from a quick dash to the liquor and grocery stores when you’re trying to concoct something that will appeal to the greatest number of people. It was sweet and indelibly marked by the unusual coconut taste found only in Coconut Rum. We ordered one of the sharable starters, honey garlic wings, but received something that wasn’t even on the menu. 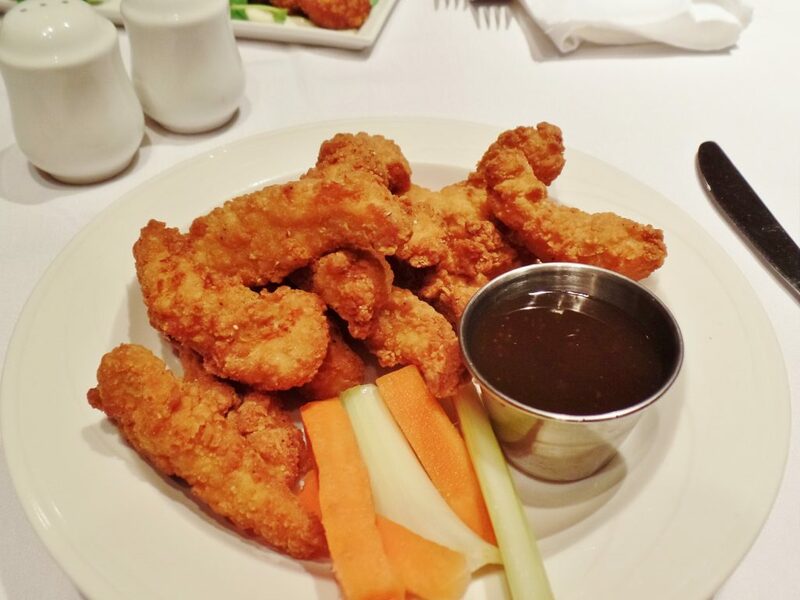 Every parent would recognize the breaded chicken strips that arrived. Kids eat tons of them. Mickey Quinn’s golden, crispy strips of white chicken were good (unlike the sauce reminiscent of a bargain brand) but we had ordered and wanted wings (dark, juicy meat on the bone). 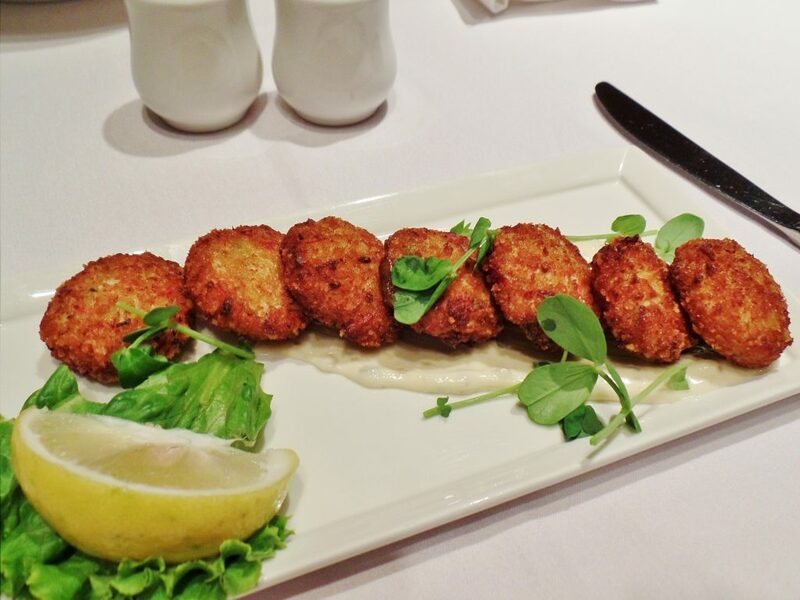 Another sharable starter, Dungeness crab cakes, featured seven bite sized cakes on a stripe of lemon caper aioli. I liked the cakes but found them very light on crab meat. Each had a modest amount of small flakes but mostly I tasted crunchy breadcrumbs on the outside and crumbs inside. Lemon caper aioli should have had real zip but Mickey Quinn’s aioli was zipless. 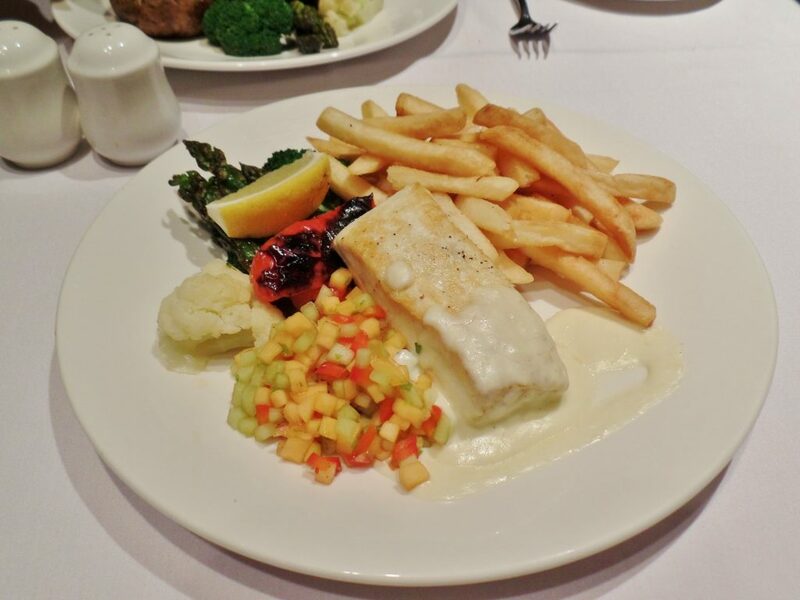 One of the seafood entrées was called Chef’s Catch, a daily seafood special. Our server described it as halibut and melon salsa with a choice of “starches” (an odd and unappetizing word to use). I chose fries. They were the kind of standard oven fries you can buy frozen at the supermarket. Asparagus, cauliflower and a flaccid piece of roasted red pepper appeared as uncredited extras. The melon salsa turned out to be diced (tiny dice) fruit, mainly melon and cantaloupe. I would call it fruit salad rather than salsa. It did not appear to have been marinated or tossed in as much as a teaspoon of juice or seasoning. Likely this would have improved the mostly flavourless out of season fruit mixture. Mercifully the very geometric (almost a perfect rectangle) piece of halibut was served with a white sauce. Otherwise I would have found it extremely difficult to swallow. What I’m sure had been a beautiful piece of fish in its raw state had been ruined. There’s no other word for it. It was as if the fish had been partially freeze-dried, having most of the moisture and flavour sucked out of it. 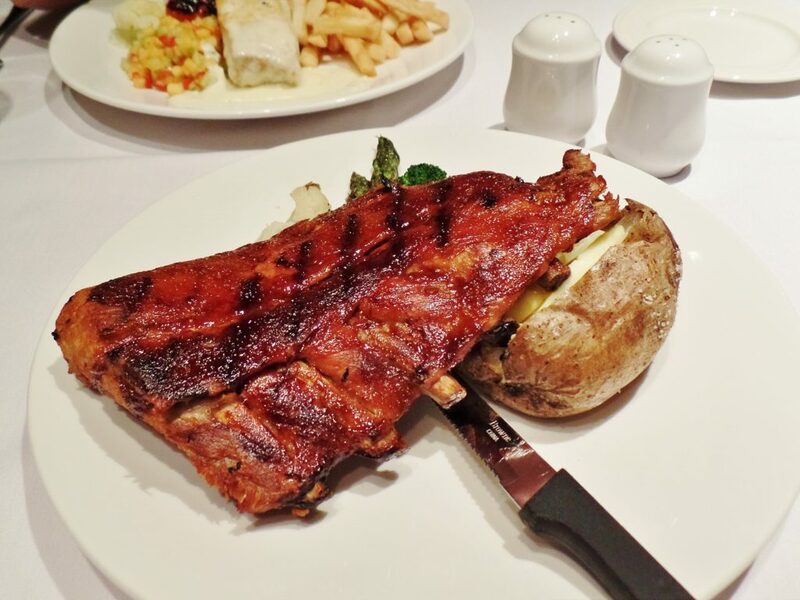 Mickey Quinn’s apple wood smoked back ribs were not much better. Mostly dry, the opposite of succulent, they reminded me in taste and texture of a product that had been frozen too long. Similar vegetables were served, with the “starch” of choice this time being baked potato. Butter was melting over the potato but it didn’t taste much like fresh butter to me. It reminded me of the taste vegetable oil acquires after oxidation, an unpleasant souvenir that lingered in my mouth long after the meal ended. 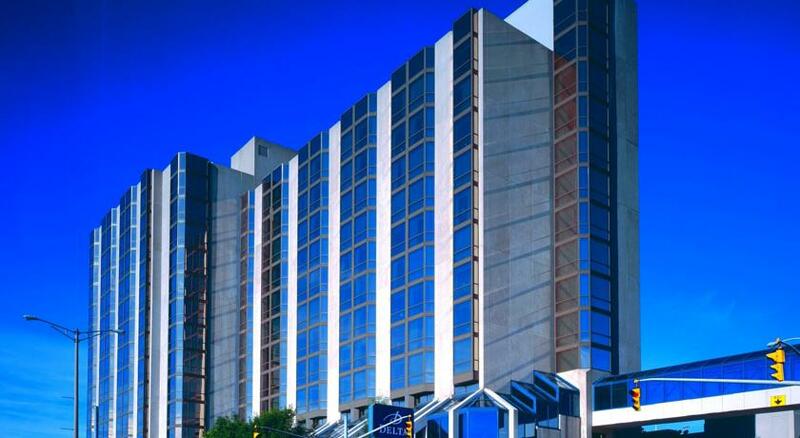 Finally, picture the Delta Hotel in St. John’s. What you see, sadly, is a concrete and glass icon of New Gower Street that has become a giant poster for the commonly held belief that instead of dining in hotels, travellers are better off eating in nearby restaurants. It’s because hotels like the Delta St. John’s through bad performance passively promote the notion that service and food may be better and less expensive at other food establishments. No star. Mickey Quinn’s is less than fair. Price Dinner for two with appetizers, drinks, tax and tip costs approximately $150. Service Friendly but our server wasn’t well informed about the menu. It was necessary for her to check with the kitchen several times on details. Also, we were not asked how we liked our meals until we were finished. We should have been asked earlier in case there was a problem. What’s the point of asking at the end? Ambiance Lively in the bar and lobby areas but in the dining area colourless and dull. Open Daily from 6:30 a.m. to 2 p.m. Evenings from 5 p.m. to 9 p.m. Parking Garage on site and street parking. Wine Mickey Quinn’s wine list features mostly New World mass produced wines, available by the bottle or by the glass in a six or nine ounce pour.